Troubled Tropical Paradise In Alexander Payne's 'Descendents' Director Alexander Payne finds comedy in the crises of his flawed protagonists: a struggling writer in Sideways, a retired widower in About Schmidt and now a family man who must reassess his life in The Descendants. George Clooney plays an indifferent husband and father to two daughters, including Shailene Woodley, in The Descendants. 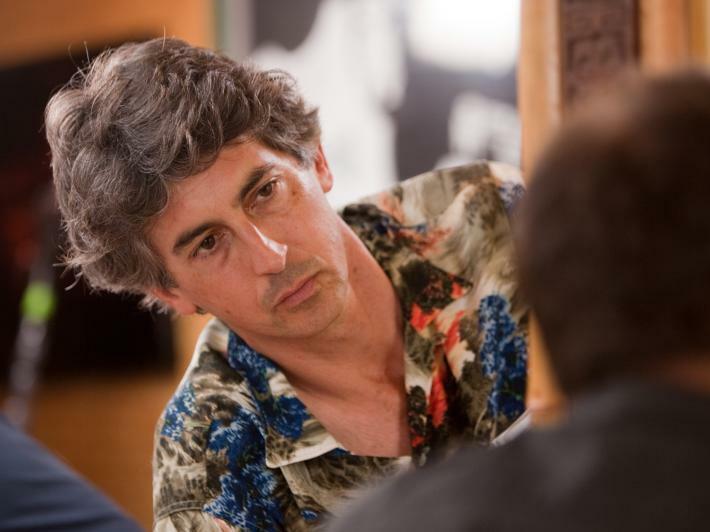 Though he's directed only five feature films, Alexander Payne has built a reputation as one of Hollywood's most respected filmmakers. His movies find comedy in the crises of his flawed protagonists — among them Matthew Broderick as a high school teacher in Election, Jack Nicholson as a widower in About Schmidt and Paul Giamatti as a struggling author and wine snob in Sideways, for which Payne shared an Oscar for Best Adapted Screenplay. Payne's latest film is The Descendants, which is set in Hawaii and stars George Clooney. He plays a Honolulu lawyer named Matt who stands to inherit 25,000 acres of prime Hawaiian beachfront real estate. Matt must decide whether to sell the land to developers or keep the land pristine. At the same time, Matt's personal life turns upside down when his wife falls into a coma after a boating accident. Her prognosis is bleak, and Clooney's character finds himself trying to solo parent his two daughters, one of whom tells him that his wife had been cheating on him throughout their marriage. Critics are giving the emotional drama rave reviews: The Los Angeles Times' critic Betsy Sharkey says the movie is "a tragedy infused with comedy [that] calls for a balancing act from filmmaker and star alike, a tightrope they navigate with nary a wobble." Rolling Stone's Peter Travers called the film "near perfect." Payne talks with Fresh Air's Dave Davies about his films The Descendants, Election, Sideways and Paris, Je T'Aime, and sheds light on his casting process. Payne's previous movies include the dark comedies Sideways, Election and About Schmidt. "It just so happens Jack Nicholson is very right for About Schmidt and George Clooney was very right for The Descendants. But [for] Sideways ... I thought no one kind of superfamous was quite right for those two parts." "He's right for The Descendants because he's the right age, he's the right look — one of those handsome rich guys out in Hawaii. And also emotionally [right] for the part — because we film viewers have detected in Clooney's work a certain charming detachment from emotions ... how he looks at the proceedings going on around him with a certain twinkle in his eye. ... I thought that would be accurate for the character of someone who's grown detached from the emotions of his own life, and has to grow to be more connected and aware and in touch with his own feelings." "The young actors who have experience and have acting chops often don't seem the age that they really are. It's like 17 going on 30. They seem like actors; they don't seem like real people. And if you try to cast someone off the street, like a nonprofessional actor, they might not have the acting chops to memorize a lot of dialogue and remain focused with all of that moviemaking machinery around them. "I saw at least 200 girls for the older part and at least 300 for the younger part. ... Shailene [Woodley, who plays Clooney's older daughter] is someone who has the chops. She's been acting professionally since she was under 10 — yet has maintained a freshness and an innocence that I [can] believe she is 17. And Amara [Miller, who plays the 10-year-old daughter] — that was a tough one [to cast]. By the time the girls would come back in and read for me, they come in and they're so drilled and rehearsed by their mothers and fathers, that any talent in them has been cloaked by what their parents wanted them to do. "But Amara had never even been in a school play — she'd never been in anything. And I found her only three weeks before shooting by the flimsiest of threads. ... A minute into the audition, I said, 'There she is.' That's someone who has no acting chops but she's very, very comfortable simply in being herself." "Anytime you cast a movie and you need someone famous in the lead part, you're a prisoner of whoever happens to be famous in the six-month window in which you're trying to get a film financed. I lament that many times, a director has to compromise about who these lead actors must be, simply in order to get the film financed — when that's the single most important element of the film that should be never compromised." "My first three films were set in Omaha, my hometown, and maybe I was trying to grasp something about Omaha — something elusive about one's own sense of place. In making those first three films, I began to acquire a certain skill set about how to do that. I think that skill set was refined a bit more in Sideways, in capturing Santa Barbara County. By the time I got to doing The Descendants and really wanted to show almost with the eye and sensibility of a documentarian, the right feeling — physically and rhythmically — of Hawaii ... it's become something I'm very, very interested in."